Hello, hello! I hope you're having a terrific day today! 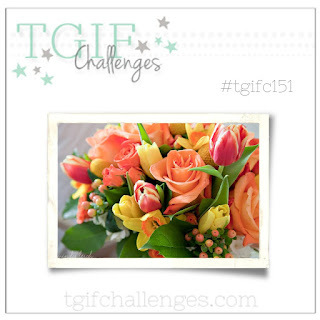 I'm glad to have you join me today as TGIF Challenges has a really fun theme this week. It's Inspiration week over at the challenge blog and TGIFC has shared a gorgeous picture to get everyone inspired to create along with them. Here's what I've created for the challenge (scroll down to see the inspiration picture). I heat embossed the roses from the Petal Palette stamp set multiple times on a piece of watercolor paper. Then I used just five colors to watercolor the whole thing: Melon Mambo, Daffodil Delight, Lemon Lime Twist, Emerald Envy and Bermuda Bay. I love the way these colors blend to make such vibrant and gorgeous shades of the colors. 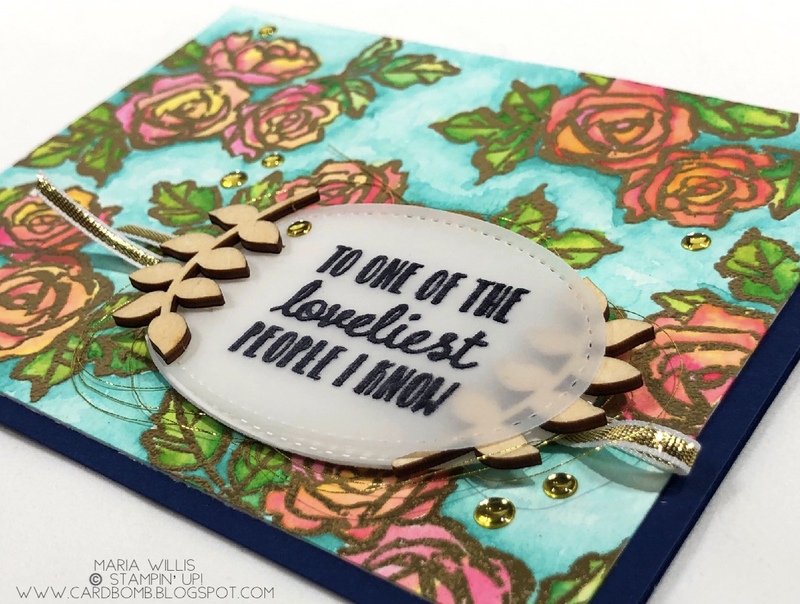 I heat embossed my sentiment on vellum and added some wooden embellishments to frame it out. I also added Gold Metallic Thread, Gold Ribbon and some Gold Enamel Embellishments. I offset the watercolored background on a base of Night of Navy cardstock and that was it for this card. Here is the Inspiration picture from #TGIFC151. I tried to stay true to both the theme of flowers and to the color scheme as well. 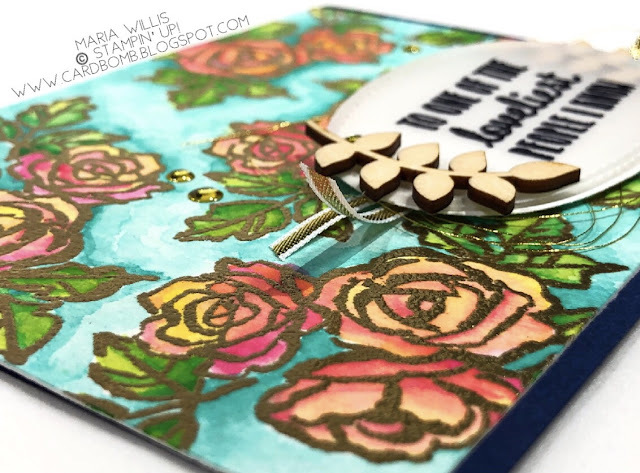 If you'd like to see some more amazing projects using this inspiration piece then head on over to the TGIF Challenge Blog and check out what the rest of the design team has made. If you've got a great idea of your own then we'd love to have you play along with us too! That's all for today but I am so glad that you stopped by. If you have any questions please let me know. You can reach me by leaving a comment below or by shooting me an email. All of the products that I have used today are available for purchase in my store (link below). 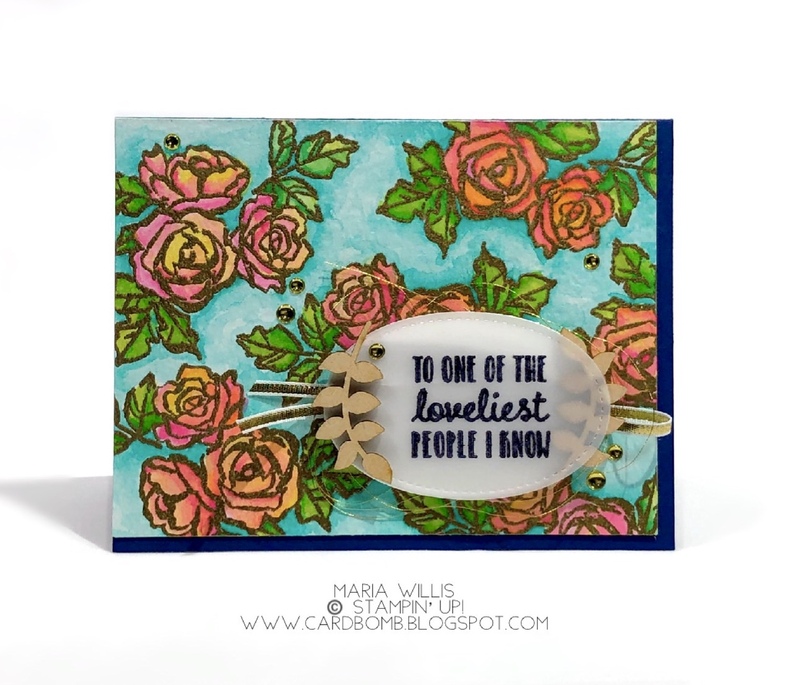 Labels: #cardbomb, #cards, #diy, #handmade, #heatemboss, #maria willis, #stampinup, #technique, #watercolor, creative, paper craft, Stampin' Up!